We are very pleased to announce that BrightBull has officially formed a joint venture with leading European inbound marketing agency Increnta. 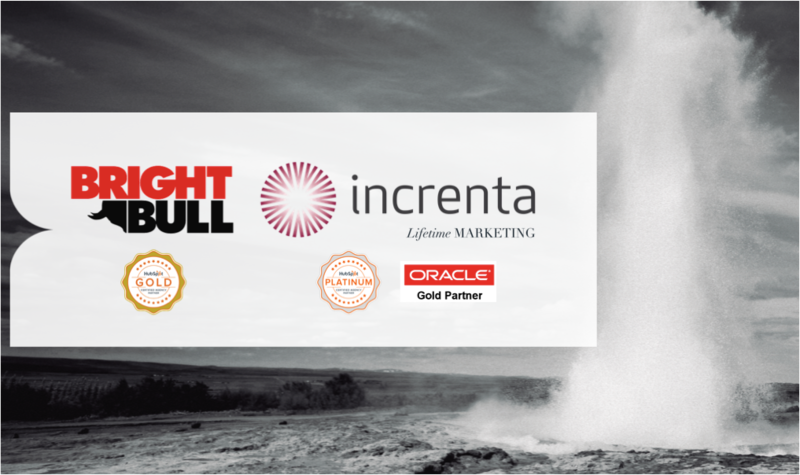 Increnta is a platinum HubSpot partner and Oracle Gold Partner with clients in 14 countries, specifically in the areas of Publishing, Training and Education, Financial Services, SaaS, Services, Healthcare and Tourism with a portfolio of 300+ clients. So what does this mean, especially for our community of B2B and event professionals? We have always been an agency with a key focus on inbound and content marketing, delivering digital campaigns, event marketing, sales & marketing automation, branding, social media and SEO positioning. Now we are particularly excited to offer web development, eCommerce, online advertising, video marketing and CRM integrations and analytics to our services, allowing us to deliver a truly integrated 360 º digital proposition. Now having an extended team of 60+ marketing and digital specialists, we're able to take our clients and marketing transformation projects to a whole new level. With a combined deployment of more than 50 successful inbound marketing deployments with HubSpot and Oracle, we can prove a stronger business case for inbound marketing. We have the numbers and data to prove this. What will change in BrightBull’s existing operations? There will be no major change in the way BrightBull deliver services to its clients. The BrightBull team will still operate from our London HQ with Ricardo and Sonia leading all projects, however we will now have the extended operational support, systems and expertise from Increnta. In addition, BrightBull-Increnta will be able to provide both strategic and operational support to any UK business with a key interest in Europe or Latin American markets – currently with local offices in Spain, Colombia, Mexico and Chile. We are delighted to be working in partnership with Increnta. As an inbound marketing agency with a solid history and reputation within the B2B conference and exhibitions industry, this partnership is perfectly timed as we see the industry undergoing a major shift towards digital transformation. Increnta's unparalleled know-how, insight and strong market coverage from over 14 years will help us deliver tremendous value to our existing and potential clients, not only in the UK but anywhere in the world. We are very excited to formalise this joint venture with the BrightBull team and for the opportunities it will represent for us to serve the events industry globally. I think that it is important to highlight that the best outcome of this union, is that Increnta will have an exceptional local team led by Ricardo and BrightBull will add a huge level of expertise and knowledge of the events industry and its transformation into the digital world, and we will be spreading this knowledge in the markets in which we are already present. This partnership will increase Increnta's presence in the UK, a key market that is growing and that will surely add new business opportunities for our existing clients. To discuss how to increase your leads and sales through inbound and for an inbound marketing assessment contact Ricardo Molina below or directly on +44 203 773 8276.